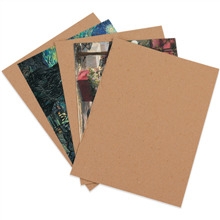 Chipboard Pads, Cardboard Pad, Kraft Pad,Chipboard Sheet, Riverside Paper Co.
Riverside Paper Co has a large selection of chipboard sheets available. Chipboard pads are idea for interleaving, or use chipboard pads to protect product vertically or horizontally from rubbing together. .022 caliper, 760 per case, sold by the case. Ship from PA, TX or IL, allow 48 hours to ship. 750 per case, sold by the case. 575 per case, sold by the case. .022 caliper, 480 per case, sold by the case. 375 per case, sold by the case. .022 caliper, 625 per case, sold by the case. 490 per case, sold by the case. .022 caliper, 350 per case, sold by the case.